My uncle makes the best version. The key is to start with good dried beans. According to him, the best out there are Camellia Red Kidneys. It’s the Louisiana brand he has been using his whole life … and the same one my grandmother used when she taught him this recipe oh so many years ago. Whenever I go to New Orleans, I always pick up a few bags of this iconic dried bean. I couldn’t imagine making this dish without them. (If you don’t regularly visit the Big Easy, you can order them on-line.) To be honest though, my preference may be fairly rooted in the nostalgia of using my grandmother’s recipe and I am sure that any good dried red kidney bean would work if you don’t have easy access to the Camellia brand. 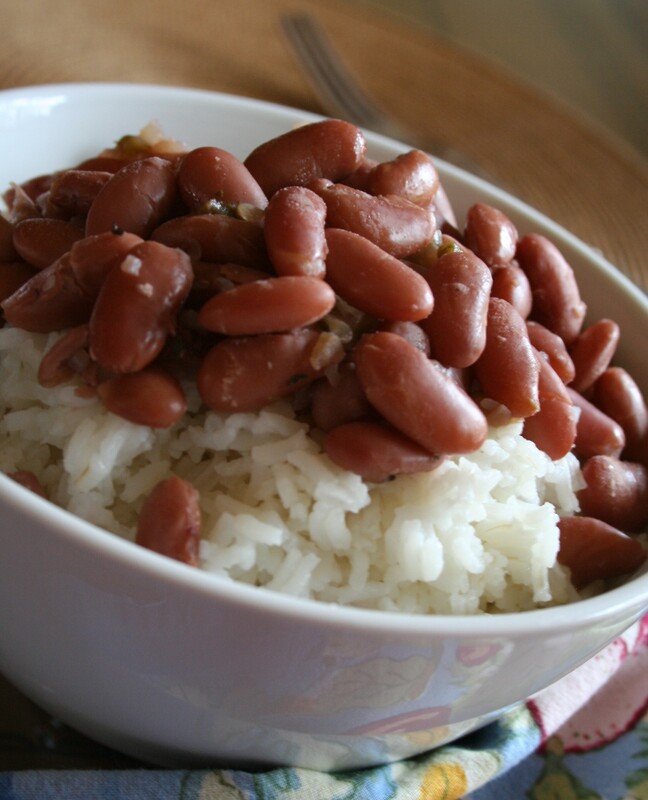 The hardest part about this recipe is remembering to soak the beans the night before! It truly is a simple one to master and destined to become a favorite. If you’ve seen the movie Julie & Julia, you know that Julia Child’s rendition of this classic French dish is what got her first book deal. When her soon-to-be-editor, tested this recipe from Julia’s Mastering the Art of French Cooking manuscript, she new she had found something special. The rest is history. 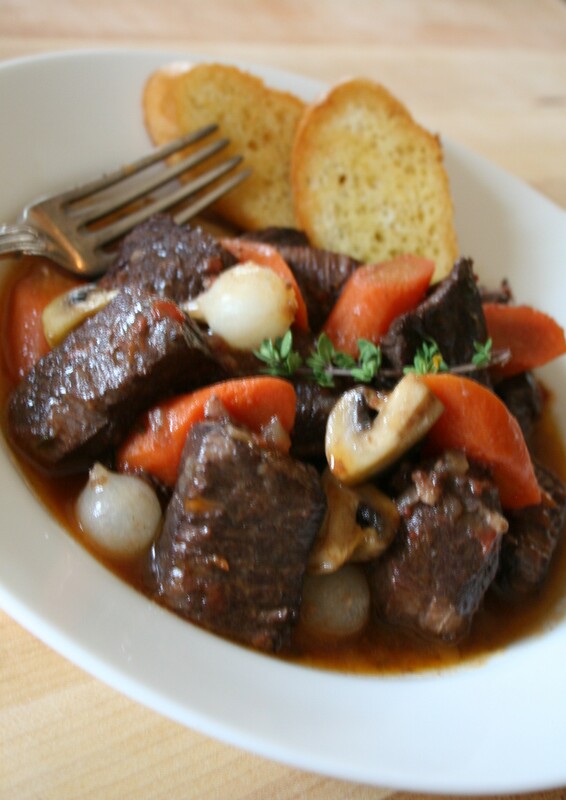 Boeuf Bourguignon (which translates into Beef Burgundy – as in the wine) is basically just a beef stew in a red wine sauce. Slow cooking a normally tough cut transforms the beef into a delicious fork-tender delight. Serve on it’s on , over rice, or with potatoes. This version is from the kitchen of another talented chef, my sister Susan. Pat the beef dry with paper towels and generously season with salt and pepper. In a large Dutch oven or stockpot over medium-high heat, warm the oil until a few droplets of water sizzle when carefully sprinkled in the pot. In 2 batches as to not over-crowd the pot, cook the meat until nicely browned on all sides, about 8 minutes per batch. Transfer the meat to a plate. Drain all but 1 tablespoon of fat from the pot. Add the bacon and cook over medium heat until crispy and the fat has rendered, about 3 to 4 minutes. Add the onion, carrots, thyme, bay leaves, and garlic. Cook, stirring, until the onions are soft, about 5 minutes. Add the tomatoes, red wine, and chicken stock and stir to combine. Return the beef to the pot. Season to taste with salt and pepper. Bring the mixture to a boil, cover and place in the oven. Cook until the beef is fork tender, about 2 hours. Remove from the oven and place on the stove. Discard the bay leaves. In a medium skillet over medium-high heat, melt the butter. Add the mushrooms and sauté until softened and golden, about 4 minutes. Add the cooked mushrooms and frozen onions to the stew. Bring the stew back to a boil and adjust seasonings as needed. Serve hot. Time Saving Tip: You can use fresh pearl onions in this recipe, but they need to be peeled and cooked first. Frozen onions are equally delicious and save you 15 to 20 minutes of preparation time. Do Ahead: This stew can be made a day or two in advance. In fact, I think it may be even better the second day. Just reheat the stew on your stove top over medium-low heat. To the pot, add the onion, bell pepper and celery and sauté until soft, about 10 minutes. (Stir often so that everything cooks evenly.) Add the garlic, oregano, thyme and bay leaves and sauté until the mixture is cooked down, about 5 minutes more. Season to taste with salt and pepper. Bring the jambalaya to a boil, cover and simmer over medium heat for 30 minutes, or until the rice is tender and most of the liquid has been absorbed. Turn off the heat and fold in the shrimp. Let everything continue to cook in the hot covered pot for an additional 10 minutes. Serve warm.